New batch of Yamaha heroes emerged as Afif Amran, Tengku Amirul and Fariznazreen all took podium spots in their respective classes for the Melaka round of the PETRONAS AAM Malaysian Cub Prix Championship. With all the hardwork they put into the preparation pre-race, it finally paid off in return. All three riders got good position that took their standings up a notch. In CP130, one fierce battle ensued once the whistle blows as Mohd Zamri Baba of PETRONAS Syntium Moto Yamaha Raceline pushed hard to set himself in the frontline breaking away from the middle pack. Zamri who started from eighth grid took off and passed championship leader Azlan Shah Kamaruzaman in a cloud of dust. Not to be content with just that position, Zamri took on front pole-sitter Mohd Fitri Ashraf Razali and made sure all his experience was put to good use as it was a battle of two generations. In the end, Zamri concluded his race in 12:37.522s in fifth place overall. Wrapping up in the back was also another senior Ahmad Fazli Sham. Fazli of Yamaha Maju Motor Racing gained a few spots ahead from where he started off on the grids. He ended his run in 12:48.666s in 6th place while PETRONAS Syntium Moto Yamaha AHM rider Zulsyafiz Rosli was rider number eight. Zamri now stands in position eight in Overall Standings with 67 points while teammates Mohd Taufiq Roslan, Fazli and Abdul Muhaimin Roslan sits in 9th, 10th and 11th with 59, 49 and 47 points respectively. 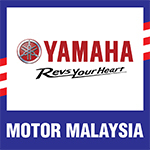 Yamaha Maju Motor Racing still leads the Yamaha camp in Team Awards with 96 points in 5th place overall behind Harian Metro Y-TEQ SCK Honda Racing and Faito Motobert Racing. A victorious tone filled the air in the CP115 cateogry as Ahmad Afif Amran brought home a win for team CKJ Yamaha Racing. The race which was led earlier on by Sasitharen Sukumaran later turned sour for the Honda rider as he lost the battle with Afif who challenged him head-on. Azhar Abdul Jalil of Motul Yamaha YY Pang Racing got fourth position ending his run at 10:20.652s while Mohd Hafieenaz Mohd Ali (PETRONAS Syntium Moto Yamaha Raceline) got 10 points for his 6th position finish. Leader Shahril Izzuwan Mohd Noor only managed 7th position. Current standings saw Shahril still on his toe sitting on top of the charts with 110 points with Ahmad Abdul Kadir (Apido Yamaha Boon Kui Racing) in fourth position behind Mohd Amirul Ariff Musa and Mohd Emir Firdaus Hassan. The Wira class also saw some impressive moves especially by Tengku Amirul Haffiruddin and Hafiz Nor Azman. Tengku Amirul did a small mistake on the starting grid but however made it up by challenging Fakhursy Syakirin Rostam and Hafiz on the front rows. Tengku luckily fought well to bring home a second place finish behind Fakhrusy in time of 8:41.757s meanwhile a fierce war resulted in Hafiz was left in a fourth place finish with Mohd Izzat Zaidi Mohd Salehan taking third podium step. Nurahmad Fariznazreen gave a jolt to the Yamaha 135 Super Series PETRONAS when he won the challenge despite a lukewarm season this year. He took the win in front of second place winner Tengku Amirul and Mohd Azrul Alif Mohd Yusof in third. Although the Yamaha boys had to face a tough challenge from other powerful teams this season, they gave quite sound performance that made head turns to their direction. As the season slowly reaches the end, it’s perfect time these riders buck up and let their machines do wonders.